We'll take a cold one...on the blockchain? As everyone’s still trying to explain to their parents what blockchain is, crypto technologies are swiftly moving along, engulfing every piece of our reality in its overwhelming grasp. Collectible JPGs of kitties that you can buy for preposterous amounts of Ethereum? Check. A blockchain smartphone? Check. But it can be used for good, too, like generating funds for humanitarian causes, or making government funding more transparent. And now — drumroll, please — it’s bringing beer right to your doorstep. That’s right: San-Francisco-based startup Civic showed off plans for the very first “crypto beer vending machine” at CoinDesk’s Consensus 2018 summit in New York. Because picking up a six pack of Bud Light in your sweatpants at the local bodega wasn’t nearly 2018 enough. The beer vending machine is supposed to be a way to prove to the world that blockchain could one day verify that you’re indeed 21 years-old, and deserve a brew after a particularly hard week at work. All you have to do is install Civic’s app on your smartphone, verify your ID on there, and walk up to the machine. Except this can only work if governments are willing to tie national ID verification methods to a blockchain — that is, a public ledger, and possibly one that could be a lot less secure, than we initially thought. And that’s a pretty big if. 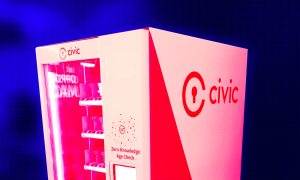 But Civic’s beer vending machine is only a prototype, meant to woo investors, and bring in business partnerships. It will, however, dispense up to 600 free beers daily at CoinDesk’s summit, so go grab yourself a cold one.